Ad revenue optimization can be done in-house, but to see real results, it’s best to work with a company that specializes in it. Don’t worry, no need to scour Google. We’ve compiled a list of the top ad revenue optimization companies and what makes them market leaders. Before I get to some of the solutions, it’s crucial to understand the revenue challenges publishers faced in 2016 and what they are most worried about in 2017. First off, publishers are incredibly intimidated by Facebook. The social network has been increasingly keeping readers on their platform and away from publishers’ direct websites. Aside from this trend, publishers are worried that in 2017, it will be even more difficult to monetize directly on Facebook. Second, publishers are struggling to attract the best tech talent to optimize for programmatic buying. Header bidding can be very complex and requires top talent to ensure high CPMs. Publishers will need to find a way to bring in top-notch tech stars. Third, publishers understand the importance of maintaining a strong mobile presence, but aren’t quite sure how to maximize ad revenues on the platform. A big part of succeeding in 2017 will be about ensuring ad revenue optimization on mobile. It won’t be easy for publishers to answer the challenges of 2017, but working with the right ad revenue optimization partner is certainly the right start. These companies provide the right technology to optimize your existing ad inventory and grow your business’s’ bottom line. Here are the top ad revenue optimization companies you should be looking at in 2017. AdPushup is a SaaS company that provides publishers with ad revenue optimization tools that automatically and continuously optimize ad layouts on websites. The company consistently helps publishers to increase both ad viewability and CTRs. Backed by Microsoft Ventures, AdPushup has around 30 employees and works with over 1300 publishers. AdPushup is a Google AdSense Certified Partner. How does it work? AdPushup’s technology performs advanced a/b testing experiments to optimize the size, color, type, and placement of your ads, as well as CTRs and CPMs. Moreover, by utilizing its machine learning capabilities, AdPushup’s system detects banner blindness and automatically adapts the ad layout of the website page to ensure maximal engagement. Finally, AdPushup uses its ‘Content-Analysis’ technology to prevent any hinderance of content consumption, ensuring both high viewability and no effect on your site’s user experience. AdPushup also supports Header Bidding stack testing, setup and optimization, and features support for all ad networks and demand partners (including banner ads, native ads, etc.). AdPushup has a multitude of product features that help publishers maximize their ad revenues. In addition to those I’ve already mentioned, AdPushup’s technology automatically creates audiences to personalize ad layouts, provides in-depth analytics reports, and delivers quick ads using its ad delivery optimization feature. If your site is struggling with ad revenue optimization, AdPushup is a great place to start. Operative is a SaaS platform that helps large web publishers and media groups to package, sell, traffic, manage, optimize and collect revenue on advertising products. The company works with more than 200 publishers and manages over $6 billion in global ad revenue annually. Some major companies Operative works with include NBCUniversal, Meredith, Refinery29, The Wall Street Journal, Comcast, iHeartMedia, BuzzFeed, VICE Media, and Vox. 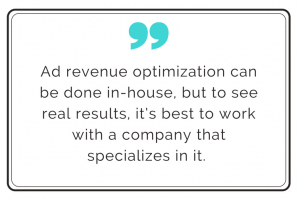 Operative answers a major problem publishers face: Ad ops teams have too much busywork and don’t have the time or capacity to focus enough on ROI. The company partners with your ad ops team to manage lower ROI activities, freeing your team to focus on more strategic, revenue-generating pursuits. Furthermore, Operative helps publishers to manage programmatic buying and planning with the least amount of busywork possible. The company reconfigures your setup to maximize prices, creates an optimization loop, sets up a reporting dashboard, and bills using accurate data. The company promises to refine your setup and save you time, while increasing your CPMs and fill-rates. If you have a headache from all the busywork and manual labor involved in programmatic buying, I would recommend using Operative. AdNgin helps publishers to test and transform their monetization tactics in order to ensure ad revenue optimization. The company displays over 10 million daily impressions for around 1200 large and small publishers. According to the company, their platform has a proven track record of increasing RPMs by over 35%, while reducing bounce rates by 17% on average. In addition, AdNgin helps publishers find the right balance between UX and website profitability. How will AdNgin help you to optimize your ad revenues? Here’s what AdNgin provides: 1) Custom ad layouts that allow publishers to experiment and a/b test ads based on data provided by the company. 2) Cross-device optimization to ensure the right ad layout on mobile. 3) A customer success manager provides publishers with an analysis of your data and periodical reports in order to improve your long-term monetization plan. 4) A sophisticated dashboard to collect and analyze all the optimal data points. Total Media helps publishers to optimize their existing inventory revenue as well as offers opportunities to increase revenue streams via Real-Time-Bidding (RTB) and programmatic buyer platforms. The company serves over 45 billion ad impressions globally and promises a ROI increase of 475%. What can Total Media do for you as a publisher? First, they provide publishers with access to the industry’s largest real-time bidding platforms, enabling publishers to offer inventory to the largest possible audience of advertisers. Second, if your site offers inventory via private auction or preferred deals, Total Media experts can consult your team to ensure high CPMs and the right monetization mix. Finally, the company’s technology promises to optimize fill-rates, while driving the highest possible price for each impression. MonetizeMore helps premium publishers to optimize their unsold inventory. The company optimizes each impression by using ad targeting, strategic ad network hierarchization, and real-time ad network shifts. The company works with 1000s of publishers, reaching over 240 million users per-month. How does it work? Publishers with over 20 million page views per-month are eligible to receive an agent from MonetizeMore. The agent will work to optimize a publisher’s revenues by providing access to premium ad networks and quality assured ads for any unsold inventory. The company provides daily reports and updates on performance to demonstrate ad revenue growth. Click Performance offers premium publishers advice and effective strategies to optimize their ad revenues. Specifically, the company specializes in optimizing native ads, display ads, and general ad serving and operations. Case studies, performed by Click Performance, of their German clients demonstrate their ability to increase publishers’ revenues by around 150%. How does their technology work? Click Performance provides publishers with STEAM, a data analytics dashboard with a variety of advanced capabilities. Here’s what it does: 1) Shows data of all the ad networks you work with and the relevant KPIs based on rRPMs. 2) Logs all events, such as shifts in ad locations, and automatically determines their impact. This is particularly valuable when working with multiple ad networks and formats. 3) Analyzes viewability using heatmaps and scrollmaps to present visual feedback of the number of users that see your ads. Where does Imonomy fit in? Imonomy is an intelligent In-Image platform that gives publishers and networks the ability to monetize the most engaged areas of websites, the editorial images. We work with over 13,000 publishers and monetize over 800 million images across the web. In addition to our In-Image technology, our platform is built to ensure ad revenue optimization for our publishers. Our platform optimizes each and every impression in a few different ways: 1) We use RTB and Header Bidding to connect with our demand partners, ensuring higher CPMs than more traditional methods. 2) Our platform uses real-time historical data and segmentation to optimize price floors. 3) Our dynamic viewability technology optimizes ad placement by automatically relocating ads to the images with the highest viewability on each webpage. We’d love to hear your experience working with these companies or others that specialize in ad revenue optimization. Let us know in the comments!